La Maison du Vert is a Vegetarian & Vegan Hotel and Restaurant in Normandy, France. Situated in a stunning valley with 3.5 Acres of beautiful landscaped gardens, we are the perfect place to come for a relaxing holiday or short break. Our Vegetarian and Vegan restaurant has a delicious international menu using ingredients from our own gardens. Our drinks menu features a wide range of French Organic Wines, local Organic Ciders and Organic French Beer. We have 3 lovely rooms in the hotel and we also have a cottage in the hotel grounds'La Petite Maison Blanche' which sleeps up to 6 people. Come and relax in our beautiful gardens, walk or cycle in the peaceful countryside, explore the local bustling markets and picturesque towns, admire glorious Chateaux and gardens. The delightful coast resorts of Honfleur, Deauville and Trouville are less than an hour away. We are perfectly placed for those visiting the WW2 museums and D-day landings. La Maison du Vert Hotel and Restaurant will be open from Friday April 19th until Sunday 15th September 2019. 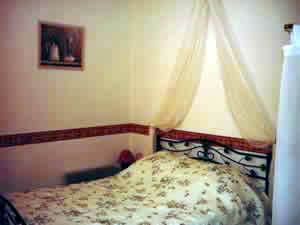 Spacious self-catering accommodation in the Charente Maritime region of South West France. 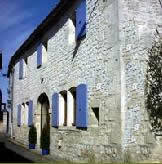 How about a self catering holiday in a spacious townhouse at Saint Savinien in the warm and sunny Charente Maritime? The gite is beautifully furnished and has 5 double bedrooms each with its own shower-room and can sleep up to 12 people. Saint Savinien is a lovely old medieval town built around the beautiful Charente river. There is a delightful leisure Island with swimming pools, cycle hire and boats that take you along the river to the beautiful historic town of Saintes. Only 45 minutes from the golden sandy beaches and famous La Rochelle. Click here to go to the Les Arches home page.